This morning we woke up to a beautiful sunrise and 38 degrees. We are optimistic about the weather and looking for better times ahead. Today was mostly a travel day going from Belgrade, Mt. to Yellowstone Park. The weather was great and the trip uneventful. Driving through the mountains was beautiful with the scenery changing all the time. The golden open fields along meandering rivers were especially beautiful. We stopped in West Yellowstone for some supplies and gas. The gas was the highest we've paid so far at $3.07! We found about five WiFi nodes but couldn't connect to any of them. There was a line at the gate to Yellowstone but because we had our new season pass in hand we got to go through the pass gate and got in front of everybody. The first wildlife we saw as a bunch of Elk lying beside a small stream. There were a bunch of people pulled over taking pictures and there really wasn't room for our rig. Next we were slowed down by a herd of Bison. People had stopped in the middle of the road to take pictures and look at them. 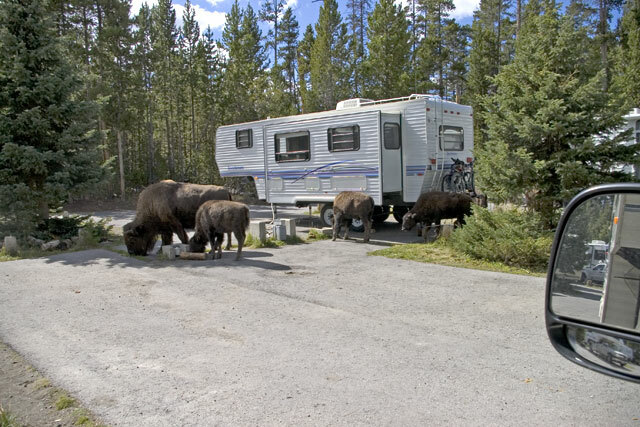 We drove past Mud Volcano and on down to Fishing Bridge Campground where we tried to set up our campsite but there was a herd of Bison in our camp spot and we couldn't pull our trailer in until they moved. After we finally got our trailer set up and had lunch we headed out. Our first stop was the National Park Visitors Center. 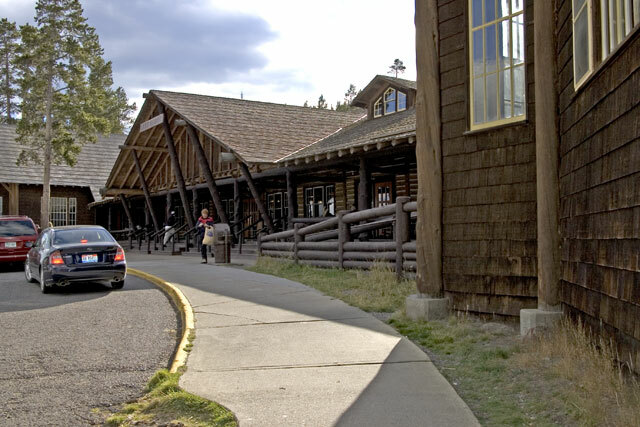 It's a beautiful rustic building on Lake Yellowstone. They have a large exhibit of stuffed birds that were fun to look at. We got some maps and information and were off to look for bears. They said that a mother and her two cubs had been sighted just a mile or so up the road. We drove up the road but no bears. 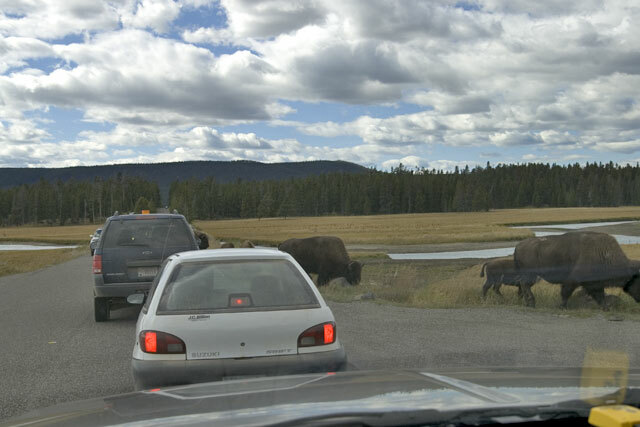 Further up the road we ran into another herd of Bison that were sauntering across a bridge and had traffic stopped. They were taking their sweet time and were in no hurry to get to the other side. We were enjoying the scenery and in no hurry also. 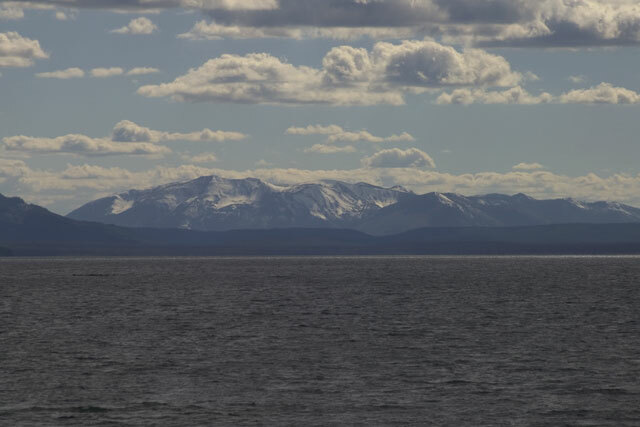 We drove on up to Steamboat Point for a great view of Yellowstone Lake looking southeast. We turned around at that point and went to see Mud Volcano about ten miles away. It's a crater of boiling gray colored water. There is a nice boardwalk trail that goes to the volcano and on around to Dragon's Mouth Spring. This hole emits a great deep rumble that was very scary to the first people that found it. 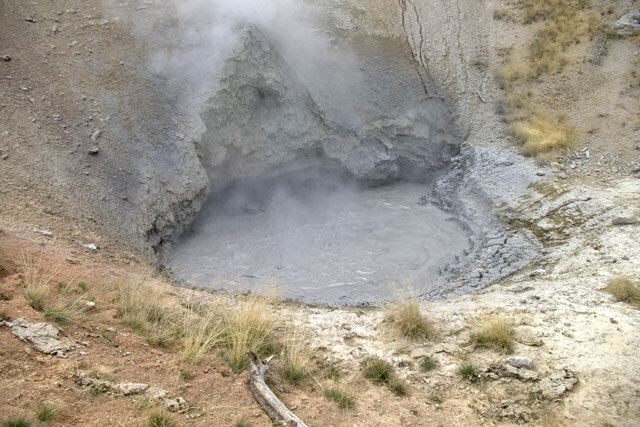 On a longer trail from the parking lot there is the large Mud Caldron which bubbles and steams. We didn't take the long hike as it was getting late in the day. On our way back to camp we stopped by Lake Village and checked out the historic old Lake Lodge. 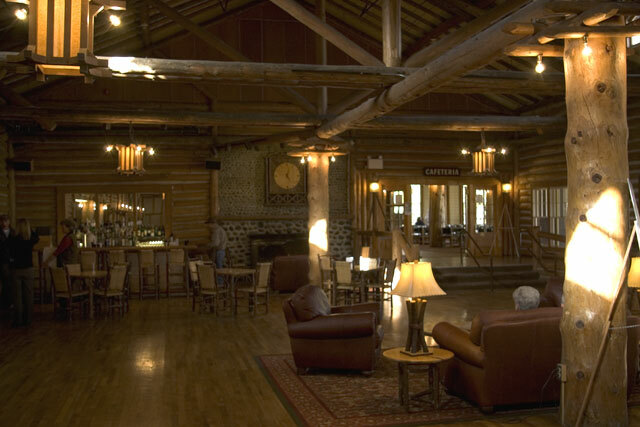 It's another one of those wonderful old log lodges that have a great room with very large fireplaces. We looked around and dreamed about what it must have been like back in the 1930's when these hotels were the grand get away of the time. We went back to our camp and had a late dinner. We were going to go to the evening presentation at the forest rangers amphitheater but were just too pooped. They have them every night so will try to catch it later. While we were winding down Sandy and Steve, Marilyn's sister and brother-in-law showed up. They got a late start in the morning so didn't get here until 8:30 PM and had to set up camp in the dark.